On Oct 28, 2006 the Zetas warned that the lineal increase in earthquakes was about to become an exponential increase. By Dec 15, 2006 they stated that this point had arrived. Earthquake and volcano activity will steadily increase, on a somewhat linear scale. The Earth changes have been lineal, in the years leading into the pole shift, but when Planet X draws close they become exponential. Where such activity was more lineal in years past, it will become exponential at some point, and this turning point has already arrived. 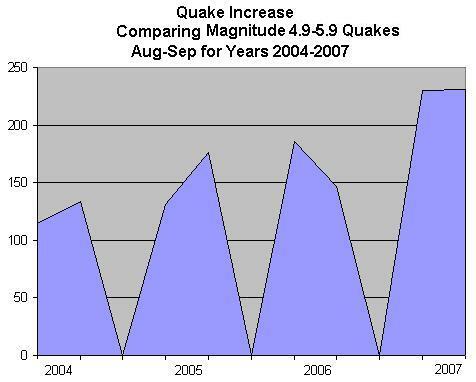 By early October, 2007 it was clear that quakes had increased. An analysis of quakes from the Advanced National Seismic System, comparing apples to apples for the months of August-September during the years 2004 though 2007, finds a greater than lineal increase in 2007. This was for quakes in the 4.9 to 5.9 Richter range, essentially Richter 5-6. The USGS has a reputation for reducing Richter or simply dropping quakes, a practice they instituted in 2003. From 2006-2007 quakes in this range took a 38% jump, from a total in Aug-Sep of 333 in 2006 to 461 in 2007. Comparing 2005 to 2006 for Aug-Sep, the increase was only 8% and the year before only 23%. The lineal increase had begun!